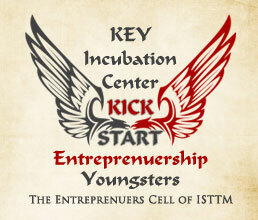 "KEY for excellence" is an entrepreneurship development and incubation cell of ISTTM business school. At KEY center, students are thoroughly trained and guided on various areas of entrepreneurship by the senior alumni of IIM Calcutta and the successful entrepreneurs from various industries. Promoting the idea - promoting online through social media and other digital marketing channels and offline direct marketing. Supporting the idea - KEY center provides the students with Infrastructure support, administration support, Accounting Support and marketing and mentoring support for 6 months or till the first business deal gets closed which ever is the earlier. Funding the idea beyond - Key center guides the students on Project plan preparation and generate funds through Banks loans, VCs funding, seed funding organisations and other methods. Advisory Support - Once the idea turns into business and the students are confident about taking it forward with out any support from KEY Center, the Company originated from KEY incubation center would operate independently and will have life long advisory support from the senior executives of ISTTM Business School. Campus Interview - on 30th March 2019 By Karvy Stock Broking Ltd @ ISTTM Business School. Campus Interview - on 28th March 2019 By The Times Group @ ISTTM Business School. Campus Interview - on 26th March 2019 By IDBI Federal Life Insurance Co Ltd @ ISTTM Business School. Congratulations - We’re proud to announce that ISTTM Business School has been awarded the prestigious “World Signature Awards 2019” for India’s Leading Business School for Quality Education. Congratulations! - Following students are selected for Relgo Networks Pvt Ltd. Guest Lecture - A guest lecture was organised on 24th November 2018. The topic was Industry insights & career By Ms. Megha / Mr. Alva. It gives us a great pleasure to announce that ISTTM Business School has received 5 Star rating for continuous 5 years from Just Dial. A great occasion to celebrate. This reflects our passion and commitment towards our students and your Trust in us. Plot No. 6/2 & 6/3, HUDA Techno Enclave, Phase II, Hitec City, Madhapur, Hyderabad - 500081, India. © Copyright 2018-20 by ISTTM. All Rights Reserved.